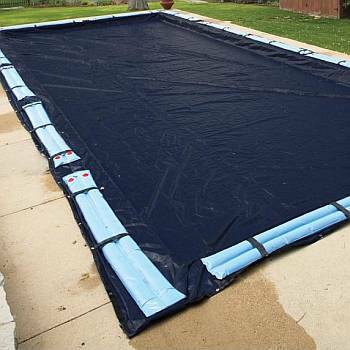 Discount Solid Winter Pool Covers keep most of the dirt, debris and exterior water out of your pool throughout the winter months. Water will need to be pumped off the cover periodically. Being black on the bottom, the amount of light that passes through the cover is limited, thereby decreasing the amount of algae growth over the winter months. Made from tough polyethylene fabric It's the toughest, most durable material available. Won't crack, split, or tear from the cold! Lightweight... easier to put on and take off your pool. Takes up less room to store, too! "Hold-tite" reinforced seams... last longer! Won't rip, fray or come apart. A super strong economically priced winter cover. Triple laminated polyethylene makes this cover lightweight yet strong. A GOOD buy at these prices! Water Bag Loops every 4 ft.